I am having trouble finding a knob that fits my wiper switch and was wondering if you guys had any answers. Does anyone know what knob fits this type switch and maybe where I could get one? I think you need the older chrome knob that was held on with a screw. I don't think you can buy a new one you'll need to find a used one. Would it be hard to upgrade to a newer switch maybe? If not does anyone have the old knob they want to part with? I may have one. Will not be able to check until I get home in a couple of days. I bought a new switch from LMC truck. Just the switch thy might have the knob also. GM never used the chrome knob. the switch might work but it won't look right. Ok buddy, let me know and I will get with you on it. The knob that your jeep uses has a center button that pushes in the washer switch portion of the wiper switch assembly to activate the pump. 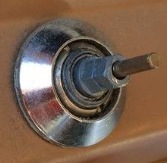 In late 1975 they changed the switch and knob to a "one-piece". The switch no longer had the button in the middle to activate the washer pump. I don't have the push dohicky......just the switch is better than I have now.